Polka Dog Bakery of South Boston, Massachusetts is all about locally-sourced, made-in-the-USA, limited ingredient natural dog treats. Their super duper Cod Skins are no exception. 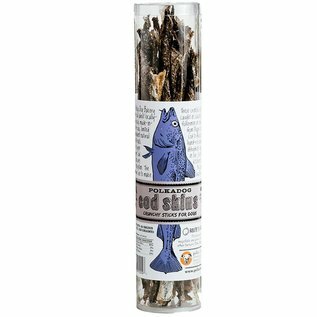 The Cod they use to make these crunchy sticks is caught in season by local fishermen on small boats from Maine to Cape Cod to Alaska. They hand-roll and slowly dehydrate each skin in their South Boston kitchen to create this savory, healthy treat. Fish skin are virtually fat-free but contain essential fatty acids and is very healthy for dogs and especially beneficial for maintaining good teeth and a beautiful coat.